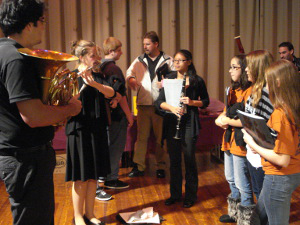 The STUDENTS IN CONCERT program is YOBC’s community outreach program. Participants in music education programs reap the proven academic and social benefits associated with the serious study of classical music – among them confidence, a sense of community, commitment, and teamwork. Working with teachers in the Bristol Township School District, the project provides – at no cost to the school district – musical instruments, music scores, instructional specialists, and other support as needed to engage students. Since January 2016, the program has expanded into the Morrisville School District with a violin program. The program allows students in grades 6-12 to receive a violin and two 45 minute lessons each week, at no cost to the participating students or their parents. On January 27, 2016, the Morrisville Board of Education invited representatives from the Morrisville Students in Concert Program to present information for the BOE’s Student Spotlight. 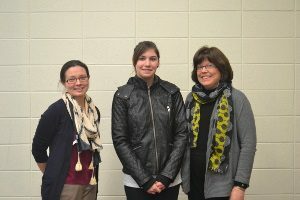 mily Anastasi and Gail Posey, teachers of the new initiative, along with one of their students, Saige Taylor, a sophomore, spoke during the Student Spotlight presentation. In February 2016, Morrisville SIC students joined YOBC members on a field trip to the Kimmel Center to hear the Philadelphia Orchestra. 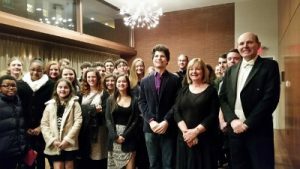 Prior to the concert, they took part in a meet and greet with Philadelphia Orchestra members and the violin soloist Agustin Hadelich. Participants in music education programs reap the proven academic and social benefits associated with the serious study of classical music – among them confidence, a sense of community, commitment, and teamwork. The Students in Concert initiative has received funding from the Bucks County Commissioners, PECO, Comcast, and others, to support their efforts.